Portraits Reunited! Your Family History Portraits! Where your ancestors are concerned, a picture paints a thousand words! We all love old family photos, but what about our ancestors who lived before the camera was invented? 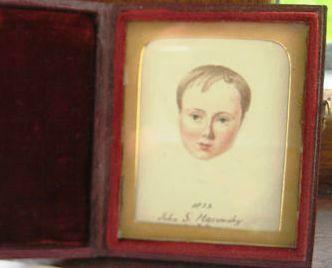 I love to collect portrait miniatures. And if they're named, then that's really fantastic. Sometimes I decide to sell one or two... Perhaps these beautiful portraits are of someone in your family tree? If Mary is in your tree, or if you've just fallen in love with her, contact me. If Conolly belongs in your Family Tree, why not reclaim him? 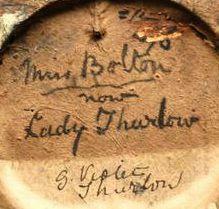 Mary Catherine Bolton, Lady Thurlow. Mary Catherine Bolton's story is very romantic. She was playing Ophelia in "Hamlet" in the West End in 1813 when Edward, Lord Thurlow, poet and peer, fell in love with her. They married in 1814. This lovely pencil drawing must have been done soon after. It later belonged to Gertrude Violet Thurlow. She was distantly related to Mary. Her husband, Edward Hovell Thurlow, was a cousin a few times removed of Mary's husband. I wonder how it came into her posession? 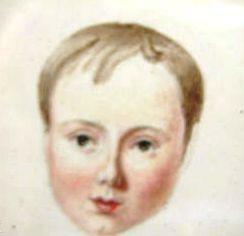 John Stuart Maconchy was born in 1819, so he was twelve or thirteen when this tiny portrait was painted. In real life, the face is barely half an inch high. John went on to live a long and fruitful life. In 1847 he married Henrietta Frances Doyne and they had twelve children. Are you descended from one of them? Contact me if you would like to own this piece of family history. 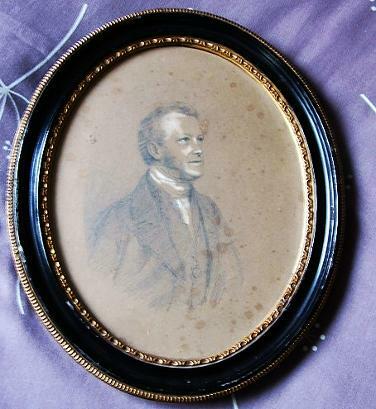 This portrait in pencil and chalk is not truly a miniature, being almost 30cm in height by about 24cm in width in its black and gold frame. It is well executed, though, capturing an animated and interesting face. Henry Venn Elliot born Jan 17th 1792 died Jan 24 1865. <?<p>Perpetual Curate of St Mary's, Kemptown, Brighton. 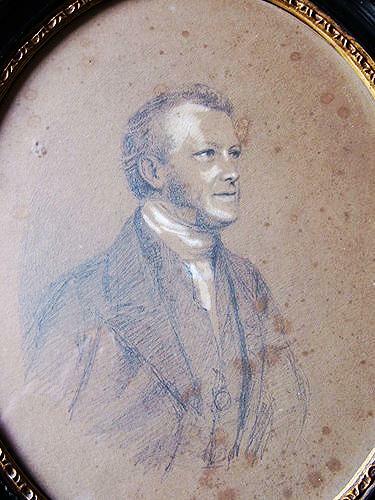 Father of Sir Charles Elliot K.C. Grandfather of MA Downe, H.V. Elliot, A.C. Elliot, FLD Elliot and Claude A Elliot. Perhaps you are descended from one of these people? 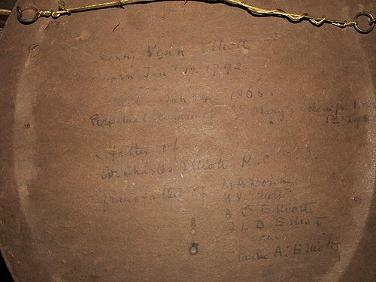 SOLD Mary St John Brander: Genealogy Mary was baptised in Lambeth on 23rd January 1833. She was the daughter of Robert Burnett Brander, a wealthy distiller, and his wife Sarah. Sarah was the daughter of Henry St John and Catherine Wigley - you can look them up in Debrett's Peerage. 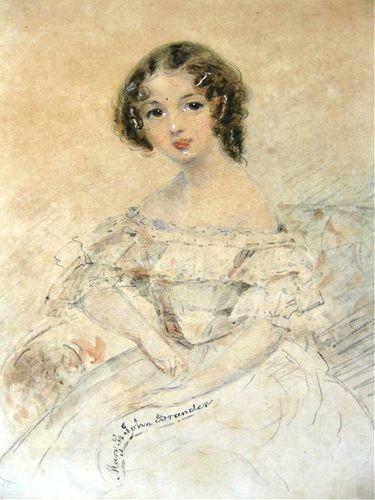 Like all well-bred young ladies, Mary would have learned water colour painting, and around 1845-50 this lovely portrait was taken, probably by a friend or family member. It is painted on board, and is only a few inches high. Conolly McCausland was born in Fruit Hill, Limvady, Ireland in 1713. Fruit Hill is now known as Drenagh. 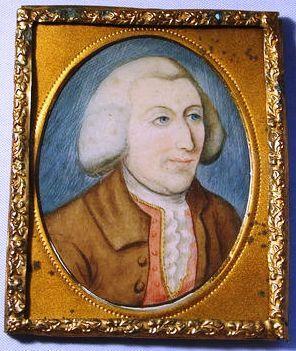 In 1742 he married Elizabeth Gage. 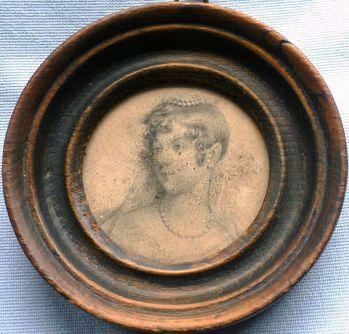 Perhaps she carried this tiny, finely-painted portrait with her. It is only just over an inch wide and a couple of inches tall. It is under glass in a yellow metal frame. "Conolly McCausland" and "Fruit Hill" are just visible on the back. The glass has dirt on the inside, but to clean it off would be too damaging to the back paper which holds the secret of her identity. Are you a descendant of Lady Thurlow or Gertrude Violet Thurlow, nee Dodd? Contact me for more information or if you would like to own this miniature portrait. By carefully removing the glass and yellow metal mount, it is possible to see that the writing says: 1832 John S Maconchy by DM. This may have been John's mother Deborah Maconchy, nee King. If you've found this page useful, please click on the Tweet, Facebook Like and Google +1 icons to recommend it. Thank you.